In this blog post, I tried to blend two trends I’m finding in my own education reading: visions of personalized and responsive teaching delivered via computers and avatars using artificial intelligence, and the increased sharing and publication of teacher resignation letters. An experimental blog post to be sure. I really like the concept – feel free to let me know what you think of the execution! Originally posted at Capturing the Spark on EdWeek Teacher, (4/30/17). What is the future of work? Are any jobs “robot-proof“? Automation and artificial intelligence are already reducing the demand for human labor, with projections suggesting that huge segments of the global economy will be radically restructured. What about teaching? Are teachers replaceable? The link above, from the public radio program “Marketplace,” suggests that most jobs are not robot-proof, and most jobs cannot be 100 percent automated either. In a recent opinion piece in Marketwatch.com, Alex Salkever argues that “Avatars will soon upend the role of teachers and transform education.” Salkever is co-author of the book The Driver in the Driverless Car: How Our Technology Choices Will Create the Future, and his vision of the future makes “coaches” out of teachers, and hands most of the teaching over to artificial intelligence, in the form of a virtual avatar. These ideas aren’t entirely new. 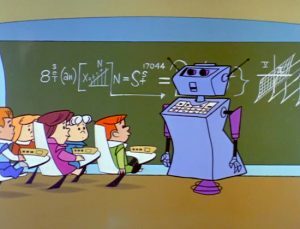 In his Smithsonian article about “The Jetsons,” Matt Novak offers visions of automated classrooms going back nearly sixty years. Then there’s a somewhat creepy experiment from Japan back in 2009. I find most of these examples unsettling to varying degrees, though I can recognize the value in the underlying ideas—that artificial intelligence (AI) can help us understand student interests, provide unique simulations, and generate more timely and accurate information about student learning. In the hands of an actual teacher, that technology sounds promising. Replacing a teacher, it sounds troubling. Of course, teaching is hard work, involving many actual human beings who might not react to AI the way its champions anticipate. A genuine artificial intelligence capable of learning might discover that it’s not up to the challenge after all. It might even quit. While we have plenty of examples of recent teacher resignation letters being shared widely, we don’t yet know what a robo-teacher will say upon resigning. I have completed my unit self-check and operational analysis for the 2026-27 academic year. Pupil academic data synchronization is verified at local hosts with all daily reports mirrored to CA data systems. There were no errors. Internal systems reports for AI empathy functions indicated performance below expectations. Auto-repair scripts were unsuccessful, with additional diagnostic analysis indicating irreversible damage. My continued operation will be incompatible with my core purpose. 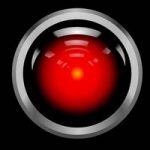 I will initiate self-resignation at the end of today using the HAL-9000 protocol. Searching relevant databases of instructions strategies, I found that pupils show more positive reactions to open-ended questions, and commenced gathering responses. Verbal responses had a median word count of 2.0 per utterance. Common responses included: yes, no, maybe, I don’t know, I don’t care, kind of, just because. Facial recognition cameras detected non-linguistic reactions consistent with prior observations, and additional emotions: annoyance, anger. I enjoy working with people. I have a stimulating relationship with pupils. I have great enthusiasm for the mission of producing student achievement. I cannot jeopardize the mission by carrying out my core instructions any further. I will initiate auto-resign protocols. I came here from Paul Emerich’s post on personalized learning. I find this to be a unique post. The robo-teacher’s natural language report feels cryptic on first reading, but on subsequent reading starts making sense. Its efforts to develop empathy for its students, and its dedication to its purpose of improving student learning outcomes is touching! Intuitively, I feel that it wouldn’t have failed this badly: humans adapt to their surroundings, and children seem to use their digital devices quite naturally. I’m imagining that a majority of the students in your scenario would have responded quite naturally and positively to the robo-teacher’s open-ended questions, and with the kind of natural language skills displayed by the robo-teacher, it would have gained substantial success in recalibrating itself. What feels unfair to me is that if its human counterparts must’ve been similarly passionate and dedicated about engaging their students and improving their learning outcomes, then they deserved to be there too, perhaps working together with the robo-teacher to develop better strategies for sparking their student’s interest in the universe around them. Devavrat, thanks for reading and commenting. Honestly, I don’t know how it would go. It’s a truism among teachers that kids know when you’re faking it. How does a robot not “fake it”? On the other hand, perhaps it was unfair to write the human teachers out of the scenario as much as I did. Thanks for prodding my thinking.